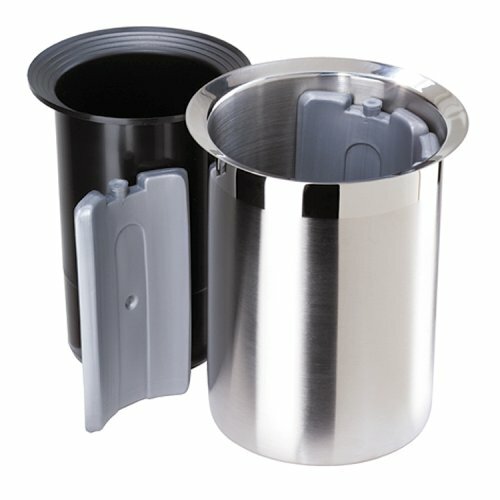 With innovative designs and contemporary finishes, Oggi’s kitchen and bath wares are truly tomorrow’s housewares .Oggi’s Wine Cooler with Freezer Inserts is no exception. This attractive cooler keeps your wine cool without condensation on the wine bottle. It’s easy to use. Simply remove black centerpiece and freezer inserts. Place inserts in the refrigerator and let cool or freeze. Once at desired temperature remove and replace in wine chiller. Replace centerpiece and insert wine bottle. Stainless steel. Do not use abrasives when cleaning. Hand wash.